New York City streets that run in old waterway courses are relatively few and far between. The most famous is Canal Street, which was built in the early 1800s on top of a canal that was built to drain out the old Collect Pond in the Foley Square area; there are others, such as Brook Avenue in the South Bronx, tracing the Mill Brook of Morrisania; and Justice Avenue in Elmhurst, Queens, which ran alongside Horse Brook in days of old. Most of New York City’s streams and ponds have been long subsumed underground or channeled into its sewer system. Engineer Egbert Lodovicus Viele (an avenue in Hunts Point, Bronx is named for him) was originally tapped to design Central Park, but that plan fell through; his 1865 map of Manhattan’s now-underground streams is still used by developers, architects and engineers today. In conjunction with the release of FNY Correspondent Sergey Kadinsky’s Hidden Waters of New York City: A History and Guide to 101 Forgotten Lakes, Ponds, Creeks, and Streams in the Five Boroughs on Countryman Press [the week of March 14, 2016], today I’m discussing two tiny streets in the heart of Greenwich Village, Minetta Street and Minetta Lane, both named for the brook that originally arouse in midtown in the Madison Square area (5th Avenue and 20th Street) and meandered southwest through Washington Square and draining into the Hudson River in a marshy area at about Houston Street. In the colonial era, it was known as Richmond Hill; in a grand dwelling built by British Army Major Abraham Mortier, George Washington made his headquarters during the Revolutionary War and John Adams and Aaron Burr later made their homes. 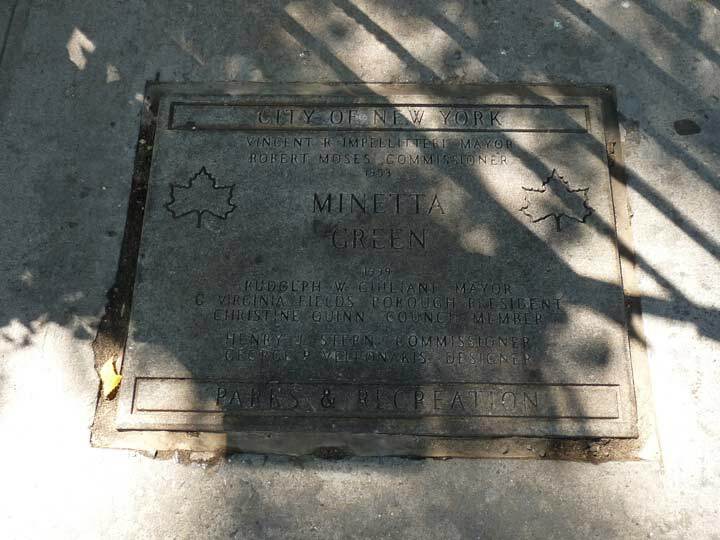 Minetta Brook had apparently been moved underground for the most part by 1830, but other than the two lanes named for it, it still makes its presence felt in Manhattan. 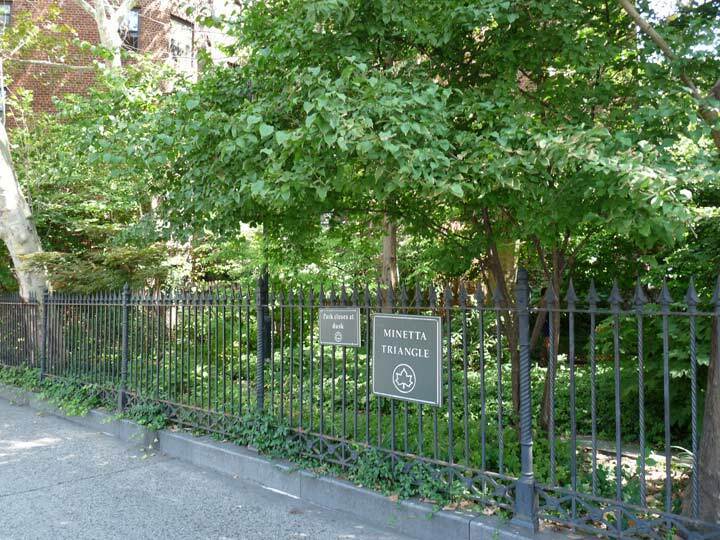 Some property lines are still angled to mark its passing, and a fountain at #2 Fifth Avenue, just north of Washington Square, used to occasionally fill with Minetta Brook water, though it seems to have dried up (the fountain, not the brook) in recent years. The name of the brook was originally a Native American word, manette or “devil water” and the term was filtered through Dutch as Mintje Kill from the Dutch word for “little “plus a diminutive term (from which English gets its “-ie” as a familiar or diminutive suffix) and kill, stream. 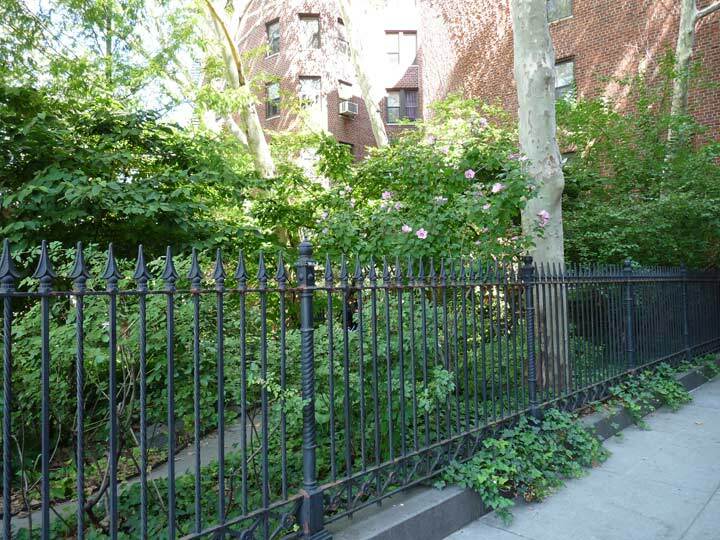 Before builders covered the brook with wooden boards for convenience, black settlers created a path along the stream, which later became known as the Negroe’s Causeway (today’s Minetta Street). Of course, the Village is known as the backdrop of the gay pride movement, but who knew that it was also home to a large African American population after slavery was abolished in New York in 1827? 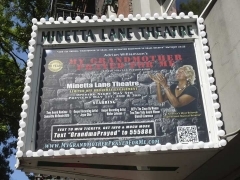 Minetta Lane is a small and becobbled valley between hills and dingy brick. At night the street lamps, burning dimly, cause the shadows to be important, and in the gloom one sees groups of quietly conversant negroes, with occasionally the gleam of a passing growler. Everything is vaguely outlined and of uncertain identity, unless, indeed, it be the flashing buttons and shield of the policeman on his coast. The Sixth Avenue horse-cars jingle past one end of the lane, and a block eastward the little thoroughfare ends in the darkness of M’Dougall Street. 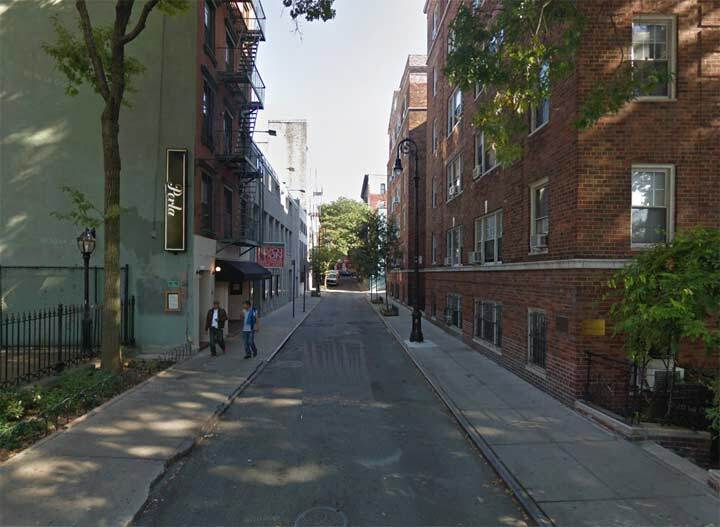 One wonders how such an insignificant alley could get such an assuredly large reputation, but, as a matter of fact, Minetta Lane and Minetta Street, which leads from it southward to Bleecker Street, were, until a few years ago, two of the most enthusiastically murderous thoroughfares in New York. Bleecker Street, M’Dougall Street, and nearly all the streets thereabouts were most unmistakably bad; the other streets went away and hid. To gain a reputation in Minetta Lane in those days a man was obliged to commit a number of furious crimes, and no celebrity was more important than the man who had a good honest killing to his credit. 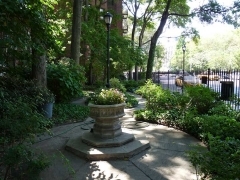 There are also a three green spaces along 6th Avenue named for the brook: Minetta Triangle (shown here), Minetta Green and Minetta Playground. 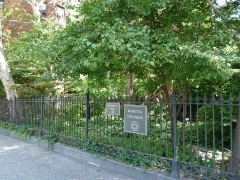 After 6th Avenue was extended south from Carmine Street and Minetta Street beginning in 1925, this parecl was left over and finally was assigned to the Parks Department in 1945. It received its latest upgrade in 1998. 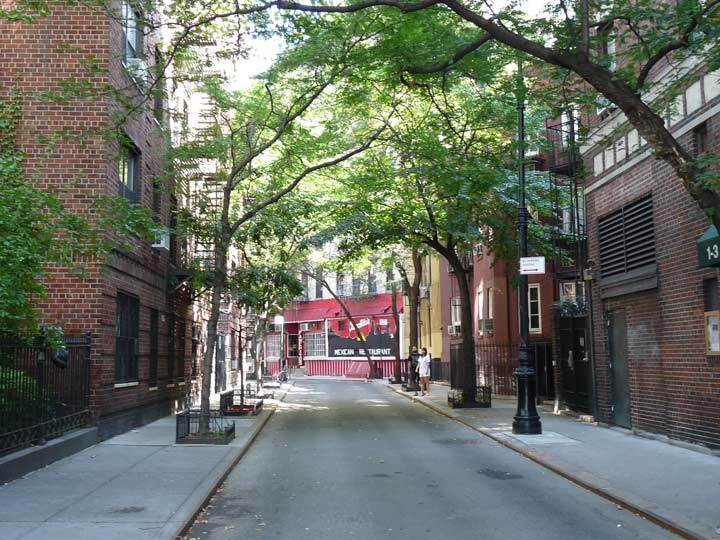 Like another Village alley, Gay Street, Minetta Street runs for one block and makes a mild bend mid-block. Its only intersection other than 6th Avenue is with a street with the same name — Minetta Lane. 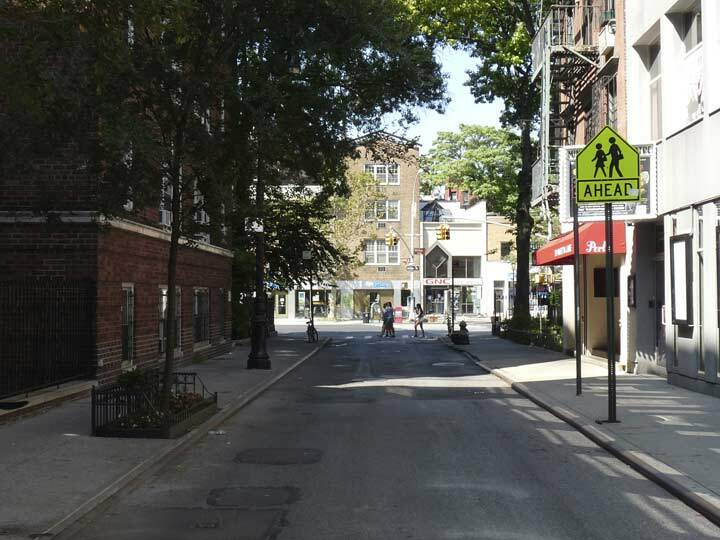 These types of occurrences are rare in NYC for non-numbered streets: I can think of Liberty Street and Liberty Place downtown, for example, and Tompkins Avenue and Tompkins Street in Stapleton, Staten Island. I don’t count dead-end alleys like Story Court, which issues from Story Street in Kensington, Brooklyn. Can anyone name others? Minetta Street looking north from 6th avenue at Bleecker. The street presently has a mix of apartment buildings as well as 3 and 4-story multifamily buildings mostly built in the early 20th Century, with some exceptions. New Bishop Crook lamps were installed on both Minettas a few years ago. #5-7 Minetta Street are neat 3-story brick apartments built with angles to tuck into the oddly angled intersection of Minetta, 6th and Bleecker. 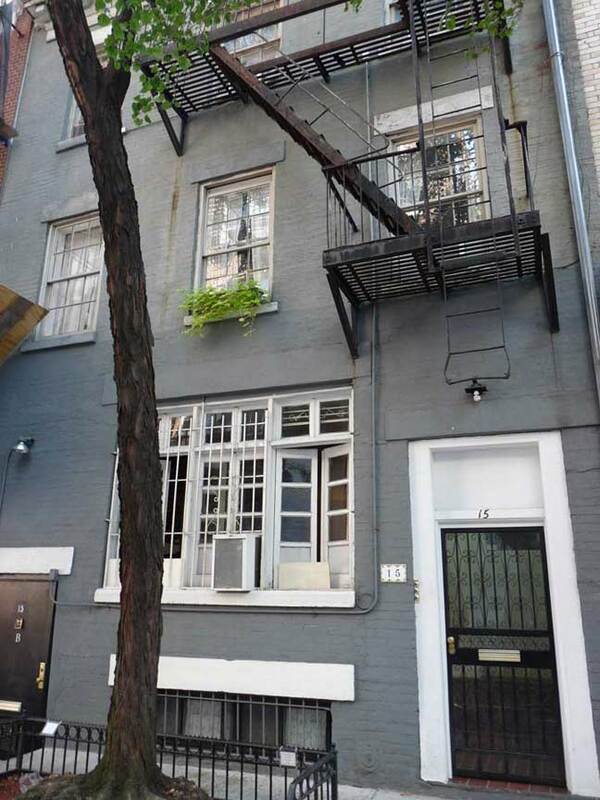 One of the apartment exteriors was used for the 1972 biopic Serpico, with Al Pacino as the corruption-busting police officer. 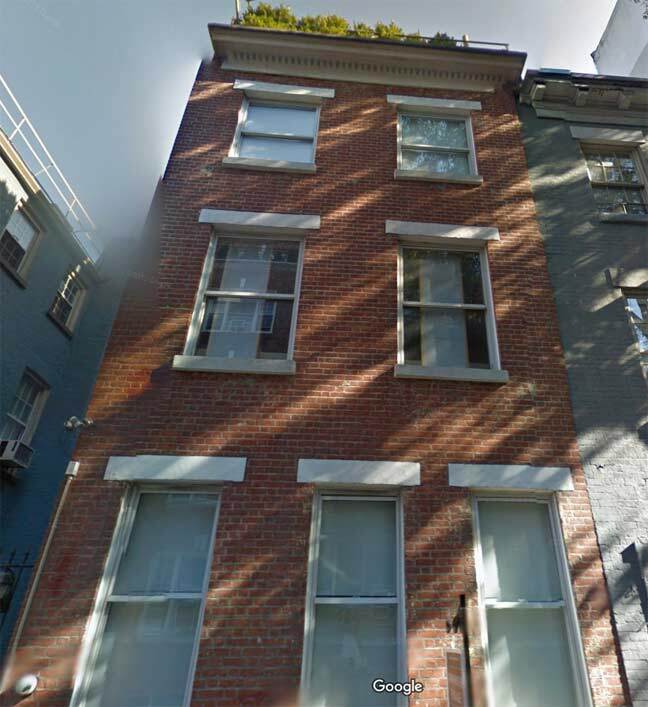 Frank Serpico himself lived elsewhere in Greenwich Village. #7 is reached by walking through the vestibule of #5. 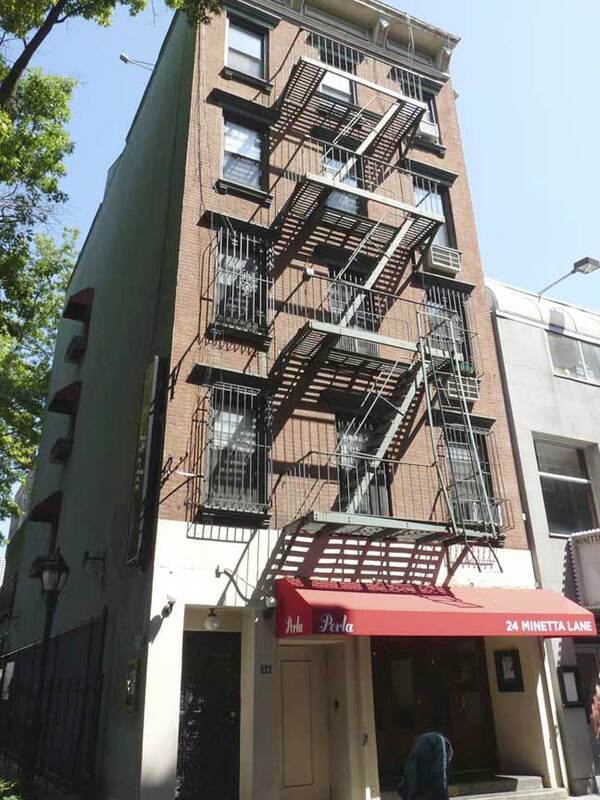 #9 Minetta Street is a 5-story brick hotel, Minetta Street Suites, that was constructed directly where the alley bends. It is currently resplendent in a gold and black paint scheme. There’s no signage to let you know it’s a hotel; reviews are not favorable. 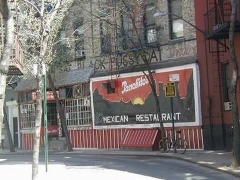 For two years, Mexican restaurant Panchito’s was the Fat Black Pussycat Cafe (1960-1962), where according to legend, Bob Dylan composed “Blowin’ in the Wind.” In the mid-1960s Fat Black Pussycat decamped to nearby 130 West 3rd Street, where it replaced Jack Kerouac hangout Kettle of Fish, which, in turn, moved to Christopher Street where it replaced the Lion’s Head, home away from home to dozens of prominent journalists such as Breslin, Hamill and Mailer. 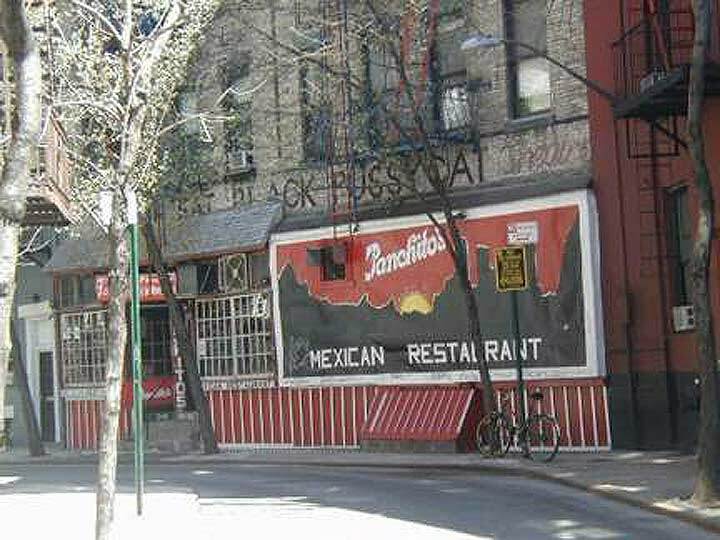 Up until just a few years ago, the ghost sign for the FBP could still be made out above the Panchito’s sign (I snapped it in 2003), but that was finally erased by the Panchito’s management in 2011; the Mexican place has been here since 1972. 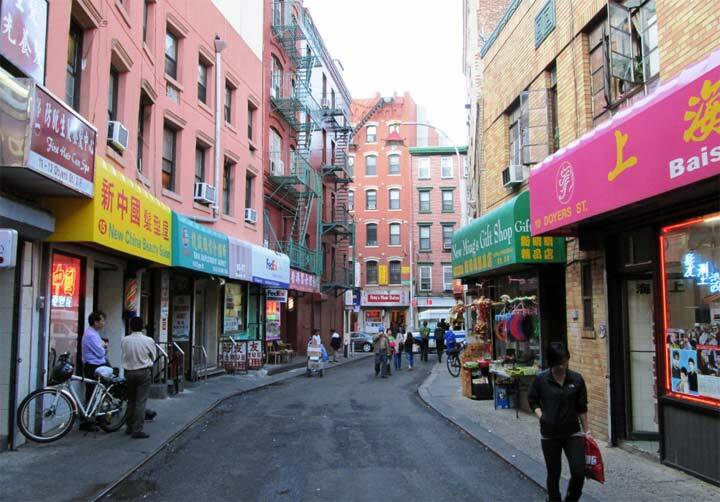 #12 and #14 Minetta Street are the oldest buildings on the west side of the alley. The rest is occupied by apartment houses that went up between the 1920s and 1940s. These two could be as old as the 1870s, though they’re probably not quite that aged. 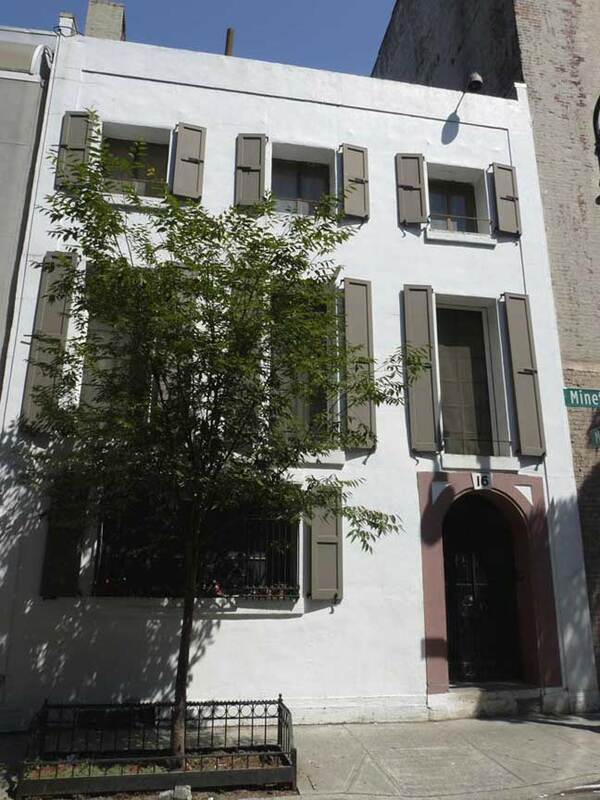 #12 has an original pair of 1st floor windows while the pair at #14 has been modernized and combined. 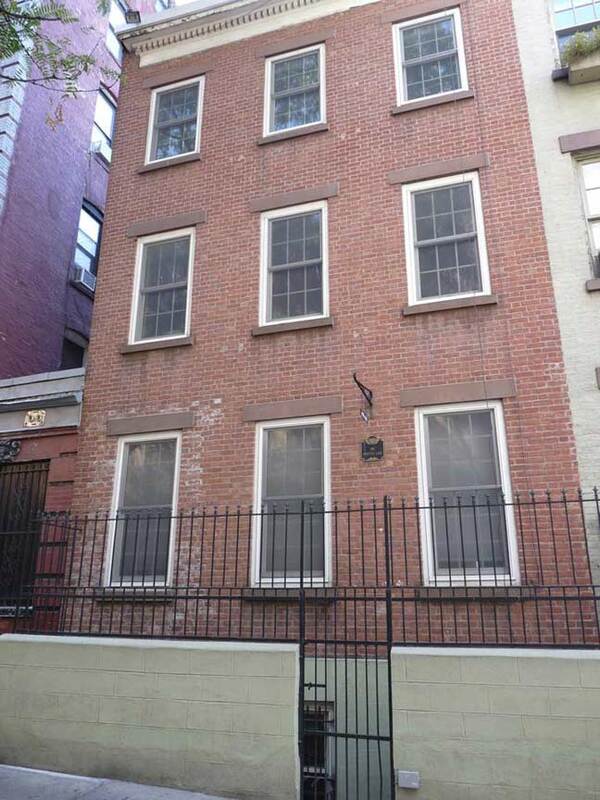 #15 Minetta Street has a nice set of casement windows on the first floor. 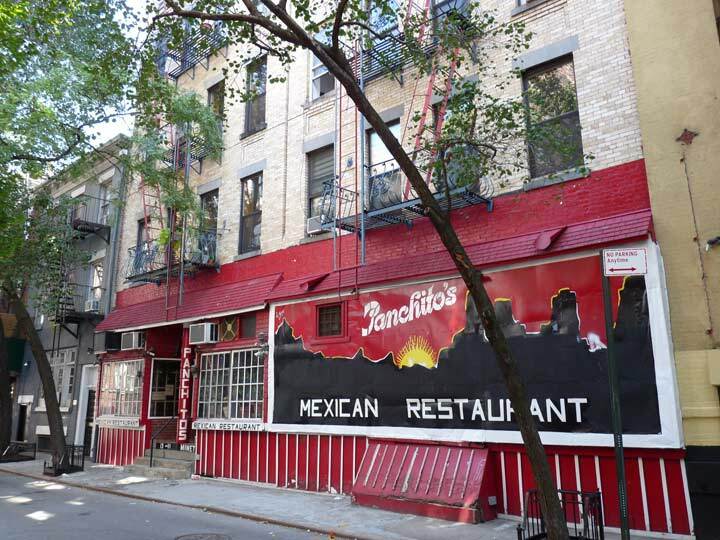 Since Minetta Street is quite narrow, it’s hard to photograph a building there in its entirety. (Do I use Google Street View? You bet I do, and I enjoy it.) 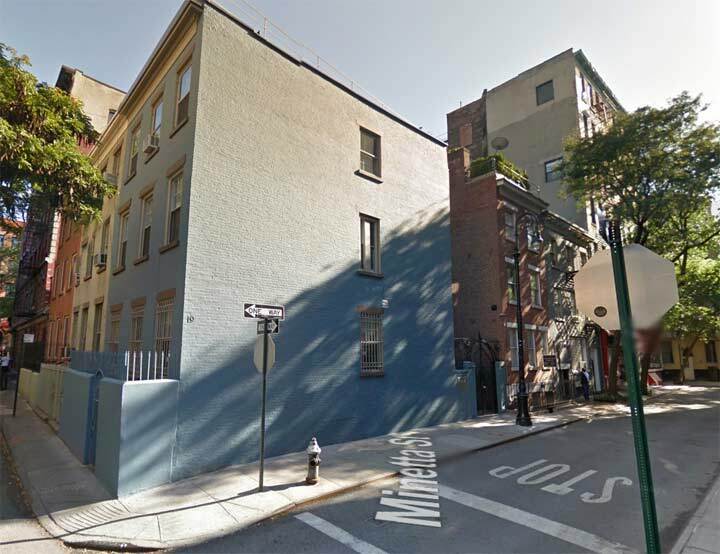 #17 may be the oldest building in the alley, as it was built in 1840 by developer David Louderback, who also built homes around the corner on Minetta Lane (see below). 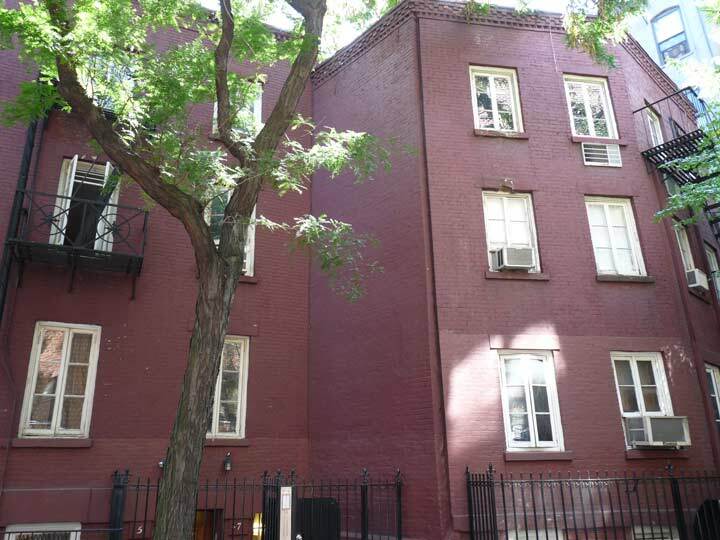 In the 1920s, these homes were redeveloped by Italian immigrant Vincent Pepe, according to Christopher Grey of the NY Times; tragically, Pepe hanged himself in one of the buildings he owned elsewhere in Greenwich Village after an apparent financial downturn. Minetta Green, another curated semi-park on an otherwise untenanted stretch of 6th Avenue, this time at Minetta Lane, was established in 1999. Across the street is Minetta Playground, with equipment provided by a nearby McDonalds. 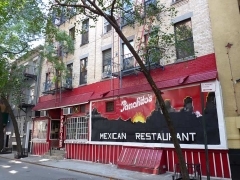 Unlike its running buddy Minetta Street, Minetta Lane runs a straight course between 6th Avenue and MacDougal Street. Older maps show it crossing Minetta Brook, and I wonder if the brook was underground by the time Minetta Lane was laid out, or if there was a bridge those first few years before the brook was redirected underground. 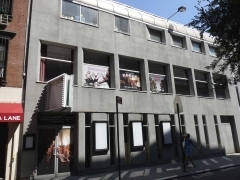 The theatre has housed critically appraised and successful productions over the years […] Such productions include Balm in Gilead; Other People’s Money; Marvin’s Room; Eric Bogosian’s Pounding Nails in the Floor; Gross Indecency: The Three Trials of Oscar Wilde; Jeffrey; Marvin’s Room; Cowgirls; The Last Five Years; Cookin; Alan Bennett’s Talking Heads; My Name is Rachel Corrie; Adding Machine, A Musical; and Garden of Earthly Delights. #16 goes back to about 1900; note the differently-sized windows on the 2nd and 3rd floors. Its eccentricities have also been smoothed out by renovations over the decades. 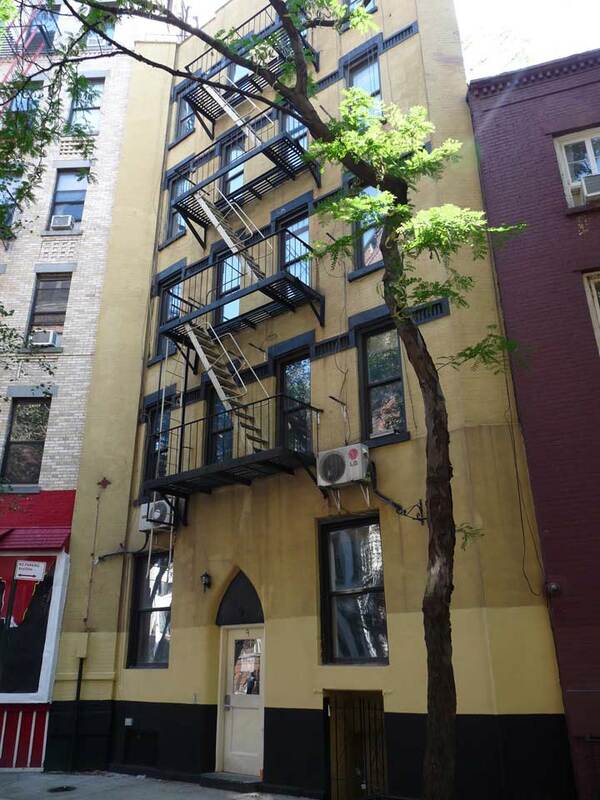 Adjoining it is the back end of the Minetta Garage, which logically fronts on West 3rd Street. 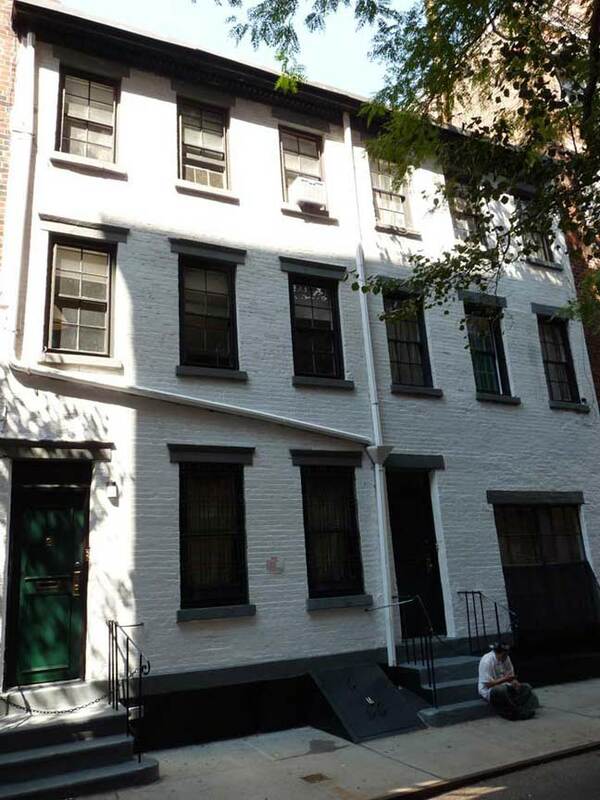 On the south side of MInetta Lane, east of Minetta Street, are three of the oldest buildings on either Lane or Street, #5 (seen here), #3 and #1 Minetta Lane, built by developer David Louderback as a trio of neat 3-story brick dwellings about 1840 and renovated by Vincent Pepe in the 1920s (all three buildings have a common back yard). They have seen Minetta Lane’s “Little Africa” period, its descent into ghettoization and its 20th Century revival. 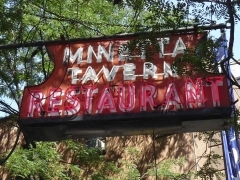 The Minetta Tavern has held down the SW corner of Minetta Lane and MacDougal Street since 1937, but it had operated as the Black Rabbit speakeasy before that in the Prohibition era. 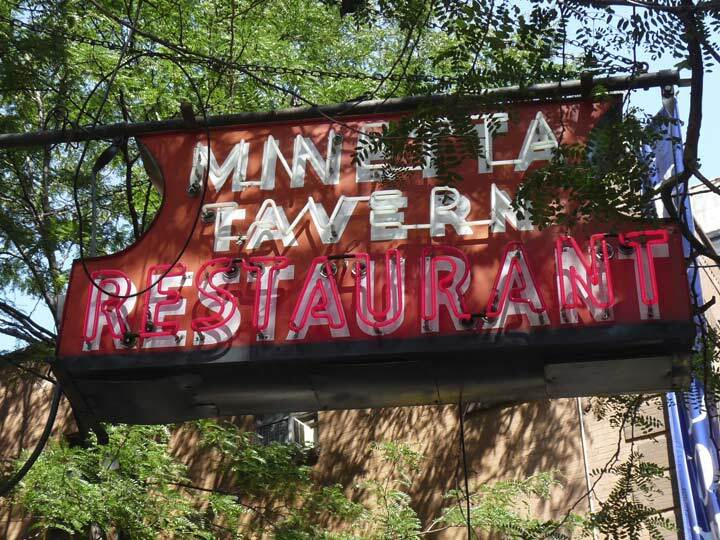 From its early days, the Minetta was a writer’s bar and counted E.E. Cummings, Ezra Pound and Ernest Hemingway among its customers, which also included the New Yorker’s Joseph Mitchell and his discovery, wild-eyed homeless bohemian Joe Gould, who imitated seagulls and bamboozled Mitchell into believing he was producing a multi-volume, the Oral History of Our Time; in the end, it amounted to only a few notebooks of Gould’s scribbled imaginings. In 2008, restaurateur Keith McNally reopened the Tavern not as a hardscrabble neighborhood watering hole but as an upscale, expensive French restaurant. One thing hasn’t changed, though: its hanging neon sign, which hopefully will be there a few more decades. Players Theatre and Cafe Wha? share the building at the NW corner of MacDougal and Minetta Lane. Manny Roth (1919-2014) opened Cafe Wha? in 1959 in the basement of a garage constructed in 1905 that had previously been a horse stable; the trough once used for horse dung was still there. 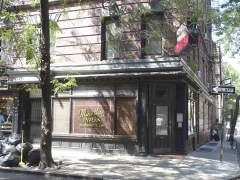 Roth converted it into a coffeehouse and performance space. When Minnesotan Bob Dylan arrived in NYC in 1960 he was employed as a harmonica player and had his first paying gig as a folksinger here in 1961. 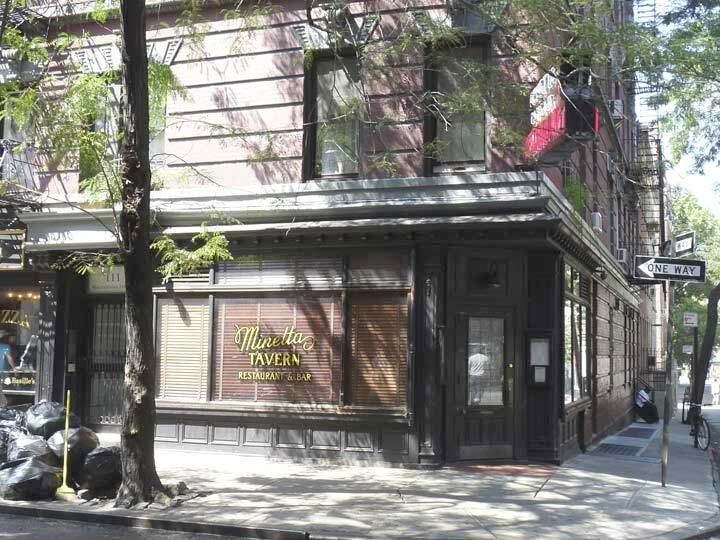 Mary Travers was a waitress here before becoming part of the trio, Peter, Paul and Mary. 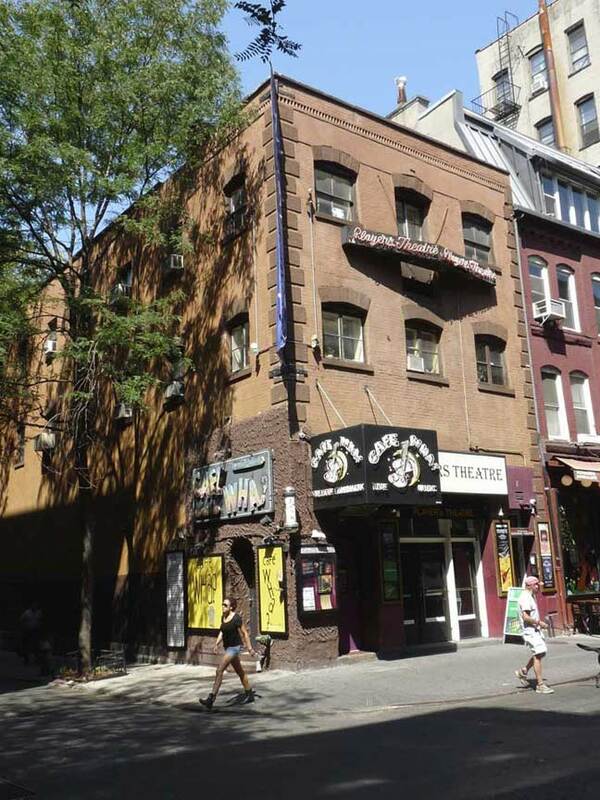 In the 1960s, Woody Allen, Bruce Springsteen, Jimi Hendrix, Lenny Bruce, Bill Cosby and Richard Prior all performed here early in their careers. The Cafe originally closed in the late 1960s, but it reopened in the 1980s under a new owner. 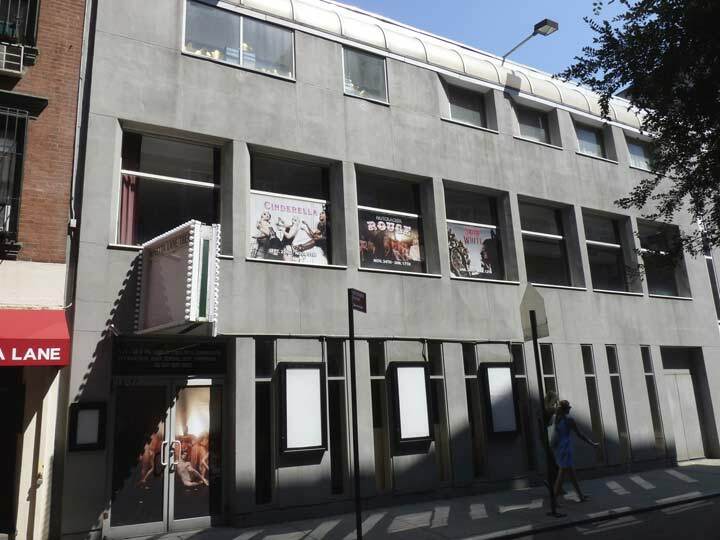 The 250-seat Players Theatre, meanwhile, has had an even longer tenure than Cafe Wha, going back to the late 1940s. For several years it has hosted A Christmas Carol — The Musical and Sleepy Hollow — The Musical, both composed by theatre owner Michael Sgouros. I live here on the lane, grew up on it in fact. In the 70s I saw Serpico being filmed and later many other films. Anyhoo, my grandfather was the super intendant for one of the buildings from 1965 to 1978, and in the basement was a gate that covered up the stream. As a kid I wondered how a stream could be covered up like that – and during heavy rains the stream would break free and flood the basement. 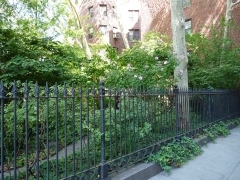 The area is quite nice now, but ‘back in the day’ it was known as “dog sh*t alley”, because all of Greenwich Village’s dog came here to poop. It was a scene, man. Love your site Kevin, cheers! 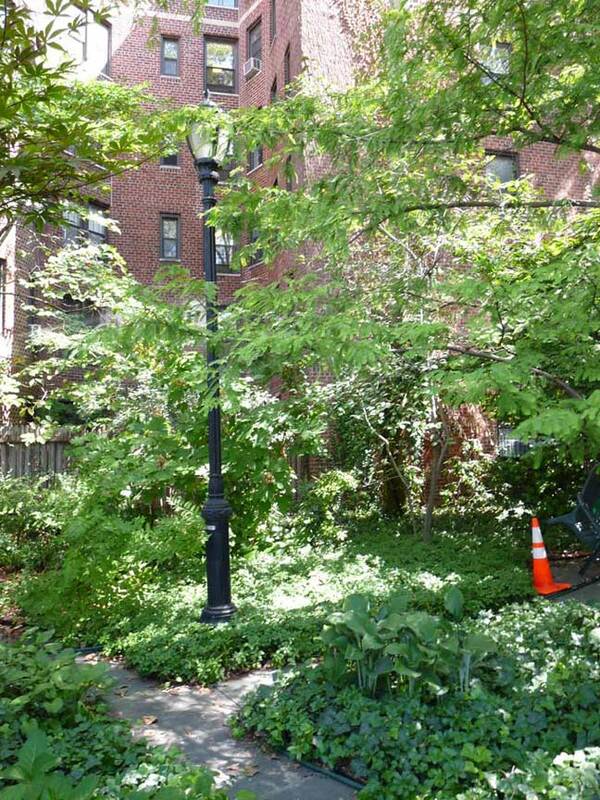 I am the current resident along with my family of number 16 Minetta Lane. There is so much more to tell about the history of this place than you let on. I would be happy to share. Contact me if you are interested. 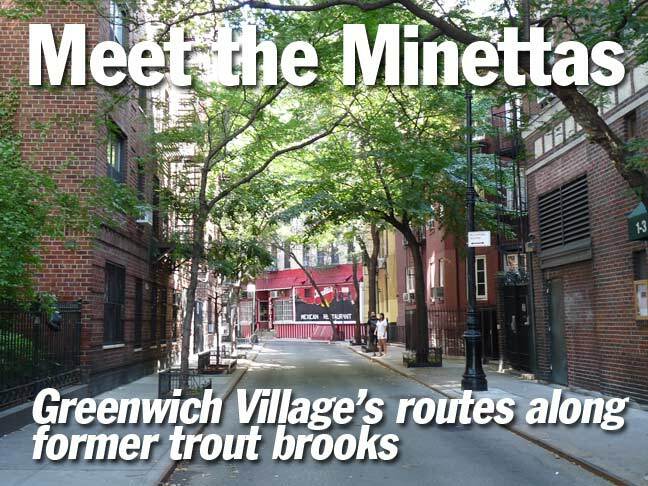 [You forgot to mention that the Minetta Brook had some of the best Trout Fishing in all of Manhattan. Imagine that.